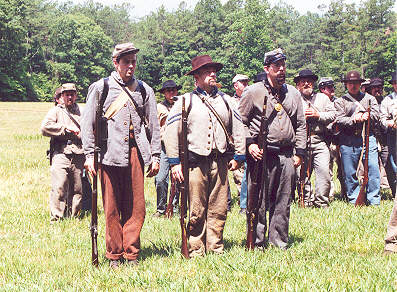 Members of the 28th Georgia giving a living history presentation on June 24, 2000, at the Cheatham Hill area of the Kennesaw Mountain National Battlefield Park. On the 24th of June of the year 2000, one hundred and thirty-six years after the Battle of Kennesaw Mountain, a small band of intrepid souls retraced our ancestors' steps, on a night dark and moonless without a star in the sky, like the inside of a Jefferson Brogan. A mixed company of young and old alike set off up the path to Cheatham Hill with an air of party and frolic. This would end before this strange night would close. The noise of tree frogs, crickets and ciccadas hung heavy like fog in the air. I have never seen a ghost but have felt and heard them, strange noises or a sudden chill in the air. Yes, they do exist. But, onward we trudged with much gaiety. Our lanterns and candles lit the path and broke some of the darkness but none of the trepidation we felt. We passed one spot on the trail where we faintly smelled something dead; some said an animal, others our imagination. I feel it was disembodied spirits warning us. We, of course, paid no heed and pressed deeper into the black and quiet woods. Later, on the way back, this putrid odor was overwhelming! We heard voices and saw dark shapes; some saw and heard nothing, deriding us for our lunacy. Up to the Illinois Monument atop Cheatham Hill we struggled. There were a couple of people sleeping at the foot of the obelisk, real people, whom we tried not to disturb. I walked to the rim of the earthworks at the Dead Angle to show the hair on my arm rise as I placed it directly above the sacred trench. The young boy, a cynic of the first order, did not quite know what to make of that but expressed his devout disbelief. A short hike further down the trail took us to the grave of an unknown Union soldier who was buried within a few feet of the Confederate trenches he was assaulting. At this point we began to get serious and joked less frequently. Our mood became somber and our tone much lower in magnitude. Whispering became the norm, so intent we were on not spoiling the present. We began to look deeply into the woods and strained our ears. Sounds began to be heard all around us; first a voice, then a scraping. Footsteps were heard above us on the path that we had just came down. There was no one else out there but our party. Returning again to the Illinois Monument, we decided to return to camp, but split into two groups. My group went back the way we had come, three adults, and the aforementioned little boy. The other group, all adults, and several in number went back by way of the road and the long way back to camp. Retracing our steps down the pathway with only one lantern to guide our way, we stayed close almost clinging to each other. The man with the lantern decided to put it out so as to see better in the dark. This was a mistake indeed. The boy, in an almost inaudible whisper, said, "We gotta git outta here! I don't wanna die!" "Ghosts won't hurt ya," I said to no avail. He only got louder still. "I don't wanna die!! Please!." He was on the verge of hysteria. "Close your eyes and you won't see anything." I'm not sure he believed me at this point. He was clinging and grasping onto me with a death grip. I quickened our pace as he moaned and pleaded. Mercifully we reached the road and relative safety. I asked him what had scared him so. He said, "I saw a Union soldier in a tattered uniform with his left arm all torn up. The soldier walked by, turned his head and looked at me and then walked into the woods." The boy had also looked up at the trenchline and saw the heads of four more soldiers watching us. This is the point at which he began to plead in earnest. None of the three adults in our group was a party to this scene; only the boy was blessed or cursed with the vision of carnage. I was flabbergasted, a cynic had seen the light and was none the better for it. He and I talked softly as we proceeded down the road back to camp. At camp several of the men were standing around and complimented the boy on his luck and bravery after hearing his tale of fright. Someone mentioned that the night sounds were gone, the night now quiet as death; and so it was. Editor's note: Although the young boy was the only one to actually see the ghosts, the rest of us did hear the voices coming from multiple directions, we did hear the footsteps all around us, we did encounter the overwhelming smell of something dead that came and went, and we did observe the loud nighttime sounds of the insects all stop immediately as if someone had flipped a switch off. Was this just the wind and terrain creating acoustic anomalies? Or was it something else? Harold "Pappy" Harmon, Sr., of Atlanta, Georgia, is a long-time Civil War reenactor, historian, and former captain of the 28th Georgia / 123rd New York Volunteer Infantry Reenactors.